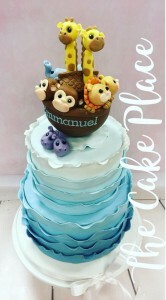 Our ready to order celebration cakes are made to order using our standard designs. 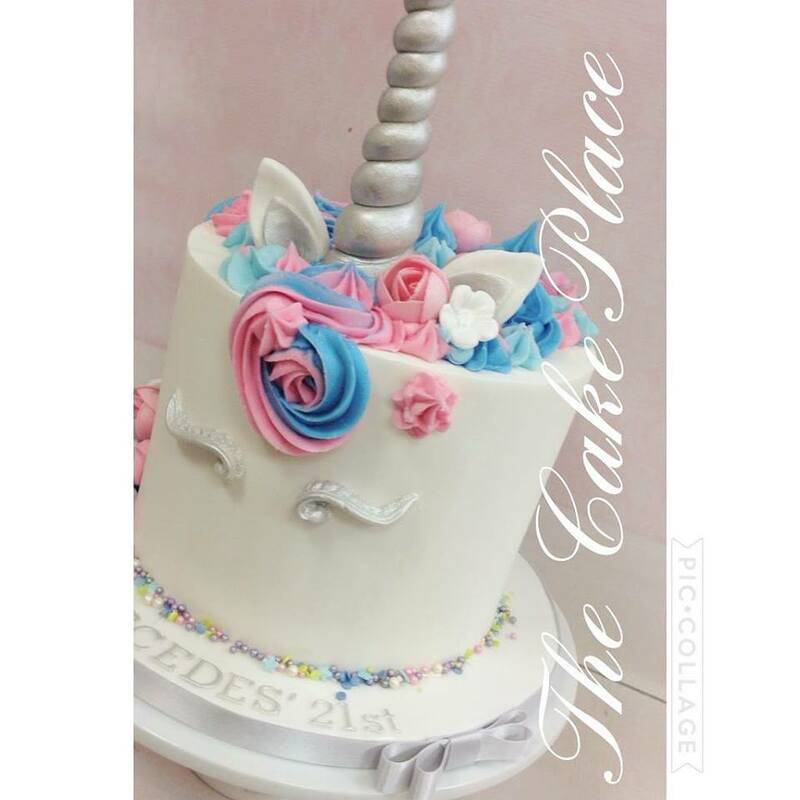 Please contact us for availability we usually require at least 2 weeks notice for cake orders. 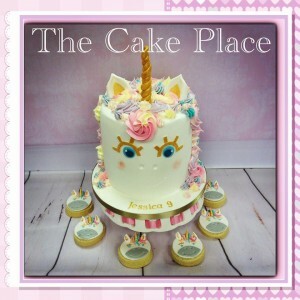 Please note that all our products are handmade and slight variations in appearance and colours may occur. 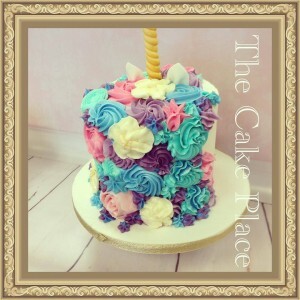 you can of course customize our designs to incorporate your colour scheme. 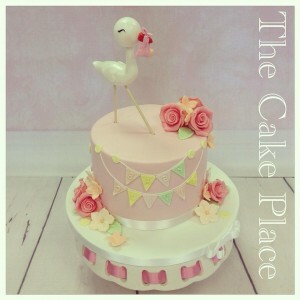 Dietary & Allergen Advice: Contains SOYA ,WHEAT/GLUTEN, EGG and DAIRY. All of our products are made in an environment that handles SOYA, NUTS, and other allergens and so may contain traces. Not suitable or vegans. 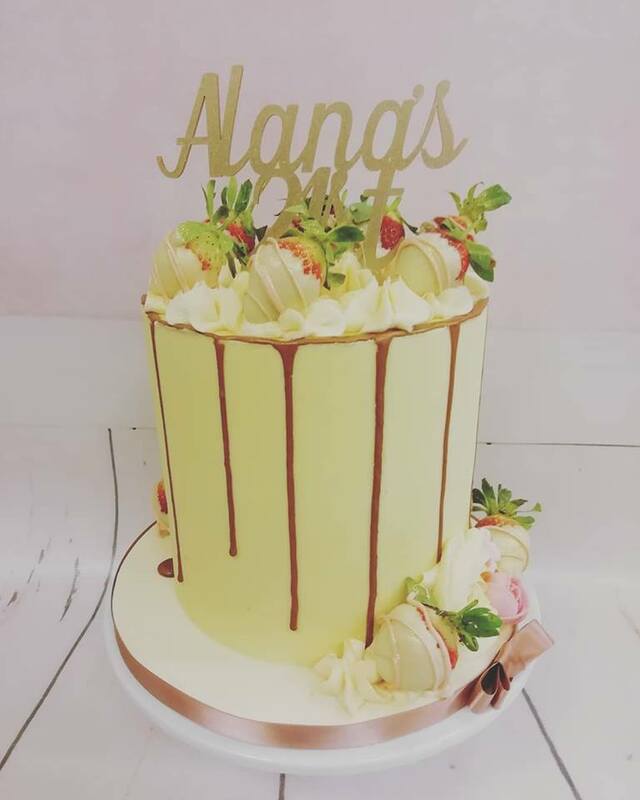 However please contact us if you do have an allergen you would like to discuss and we will happily talk you through options regarding your cake. 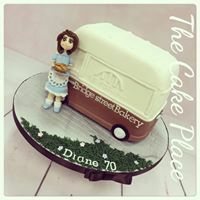 Prices shown are 2019 prices , there may be a slight increase in prices for cakes booked in 2020 to accommodate rise in ingredient costs, however this will be discussed at time of booking. Tall frosted cake on an iced board trimmed with ribbon. 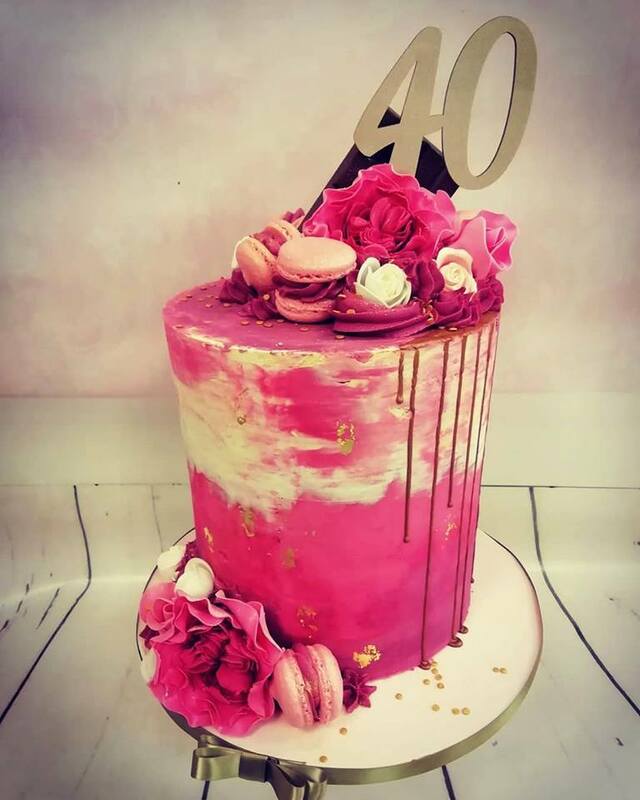 This drip cake has edible gold leaf flakes,personalized Age topper made from acrylic, Handmade macarons & meringue kisses, finished with silk flowers. 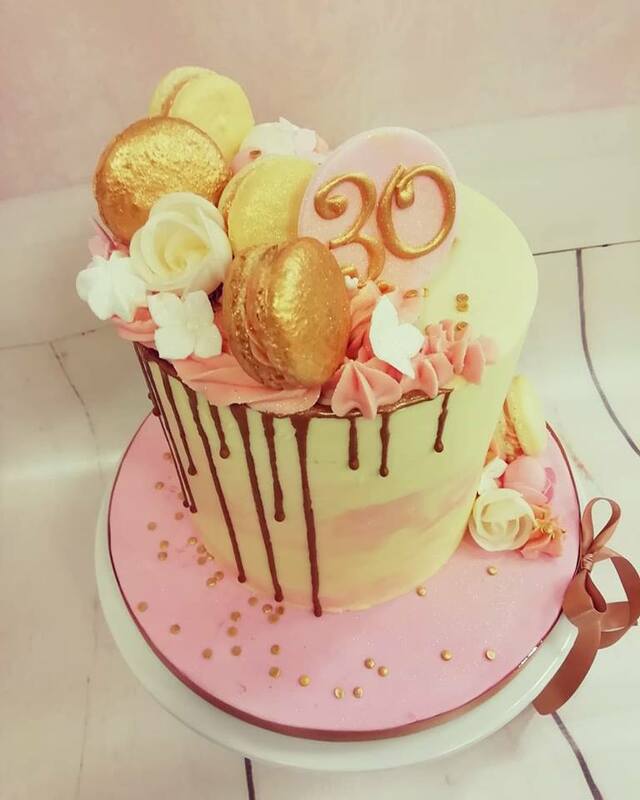 Tall ganached cake on an iced board trimmed with ribbon. This drip cake has edible gold leaf flakes, personalized Age topper made from acrylic, Handmade macarons & meringue kisses, finished with silk flowers. 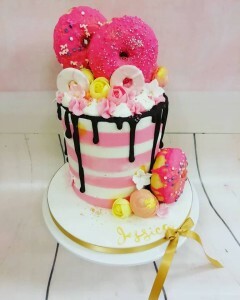 white and pink striped frosting and a dark chocolate drip make this cake look stunning. 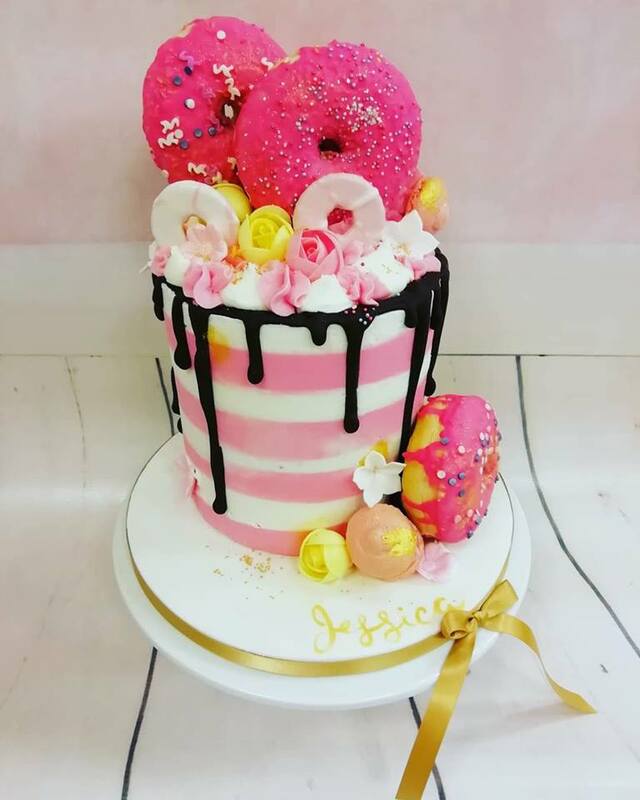 Topped with 4 iced doughnuts full of sprinkeletti , party rings & edible flowers. 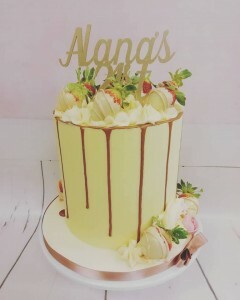 double height ganached cake, contains 2 cakes iced as one. 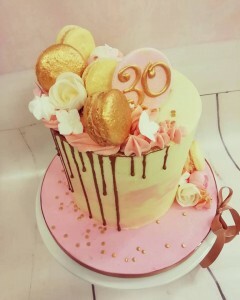 topped with handmade roses, macarons and delicious white chocolate ganache swirls with diamond icing drips& flakes of gold leaf & acrylic topper. 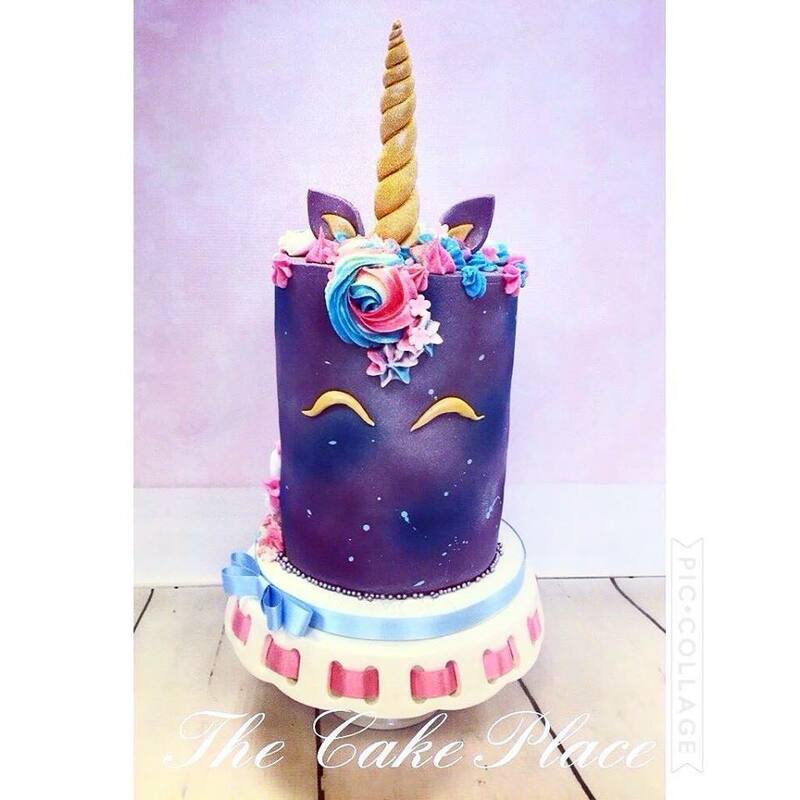 Unicorn cakes can be any colour combination you can dream up,with gold or silver modelling chocolate horns , main cake colour & hair colour, let your imagination run wild. 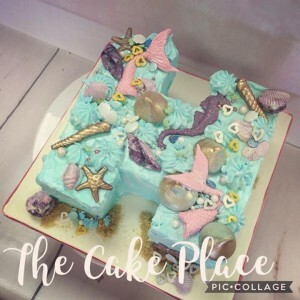 we do a few different eye designs, you can choose which they would like. 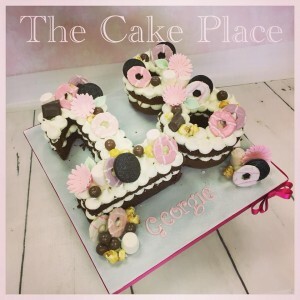 All cakes & prices show are examples ,we can make these designs in any size variation to suit serving size. 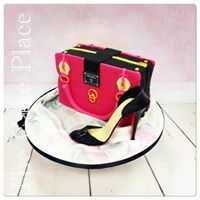 Colours can also be changed to suit colour scheme ,please get in touch. 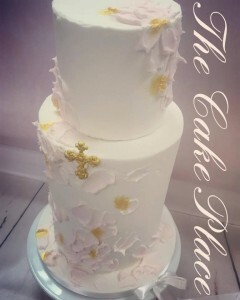 Deep 2 tier with hand made peony & hand painted ribbon. 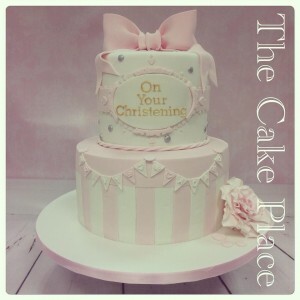 Tall 2 tier cake , hat box design on the bottom with Bunting , subtle polka dot top tier with hand made bow & Rose. 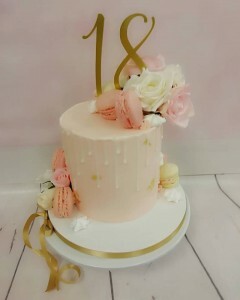 Pretty single tier deep cake with hand made topper. 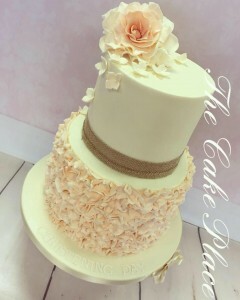 trimmed with bunting & flowers. 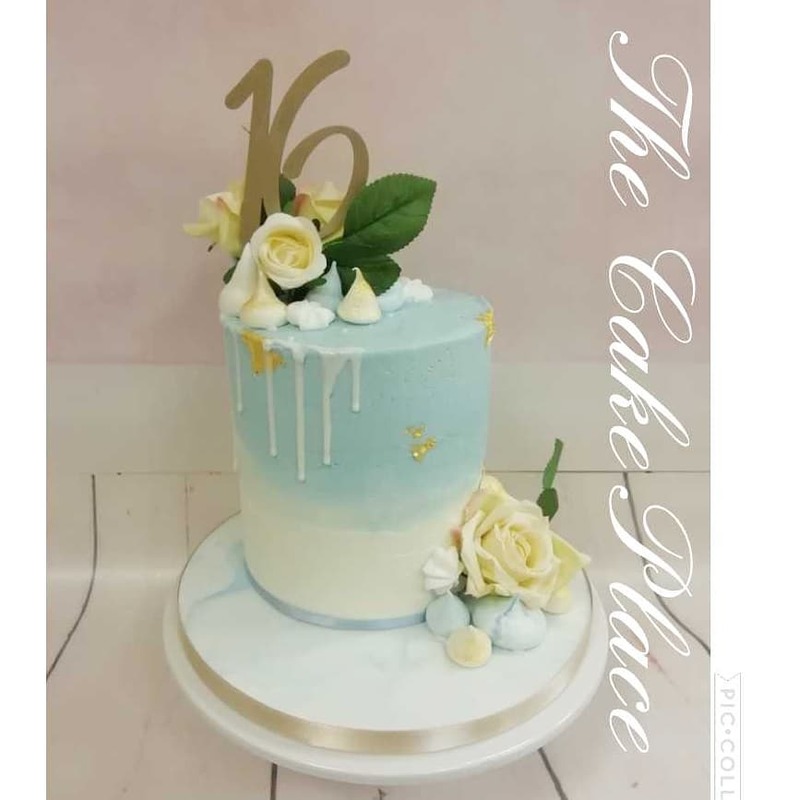 Double height bottom tier with single height top tier, iced with white frosting , very light pastel colours run through this cake with gold flecks. 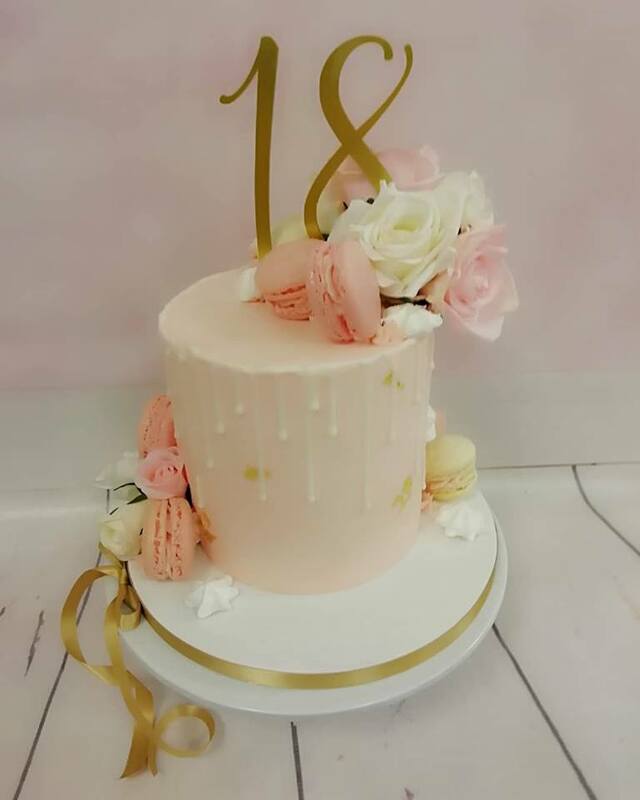 Handmade topper on top of a 2 tier cake covered in ombre’ ruffles. 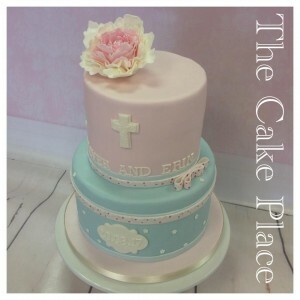 Pretty 2 tier cake ivory & peach with ruffles and handmade flowers. These fully loaded naked number cakes have 2 layers of sponge cake , delicious filling to complement with frosting piped on top frosting & topped with fondant flowers, meringue kisses, macarons, marshmallows ,popcorn, Oreos, Malteasers & added party rings. 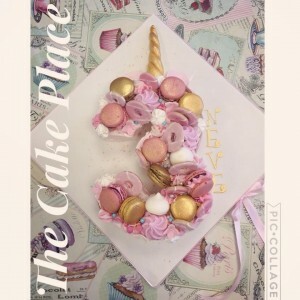 These fully loaded frosted number cakes have 2 layers of sponge cake , delicious filling to complement, frosted with colourful frosting & topped with fondant decorations, meringue kisses, macarons & of course plenty sprinkles ! 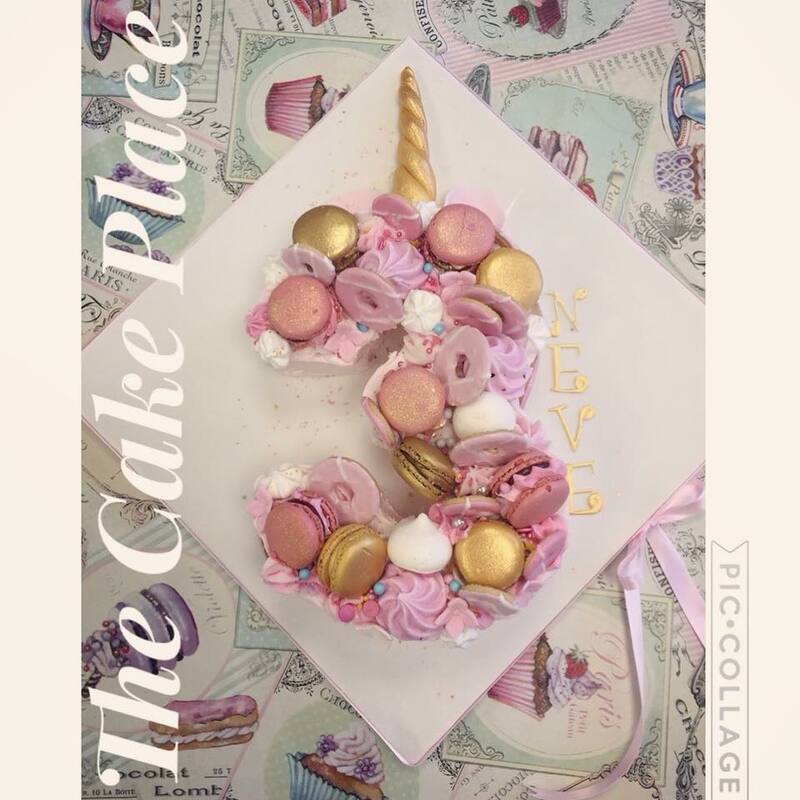 This one was Unicorn themed with added party rings, Gold horn & ears. 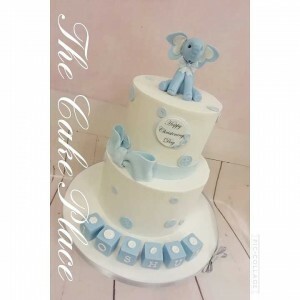 20 Servings ~ Letter Cakes are cut from 8”cakes but price will deend on the Letter. Our novelty cakes come in so many shapes, sizes and colours, below are a few examples of work we have done , with the sizes and prices. 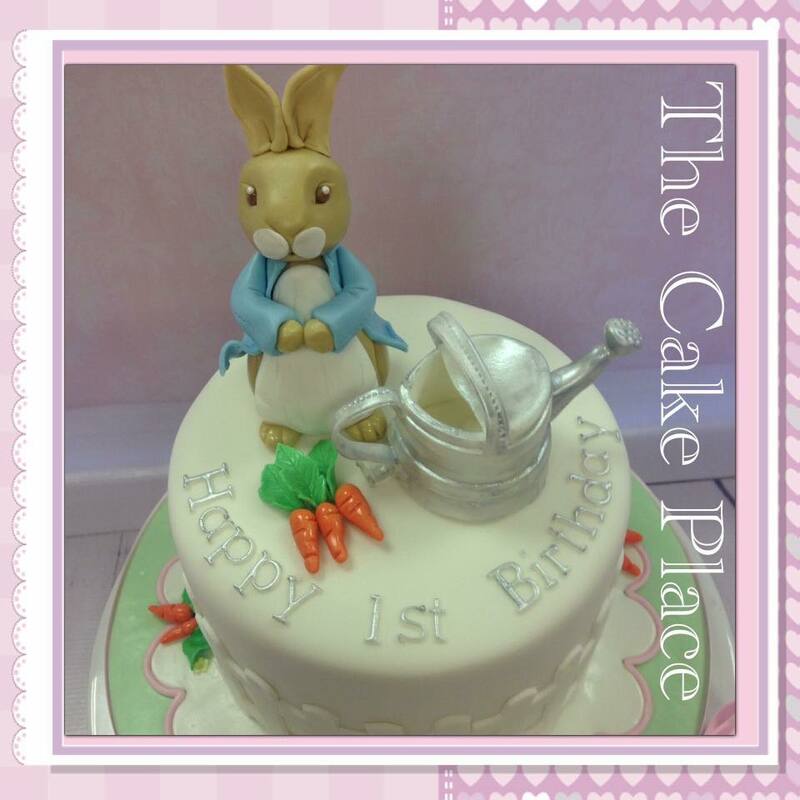 Please contact us if you would like a quote on a bespoke cake. 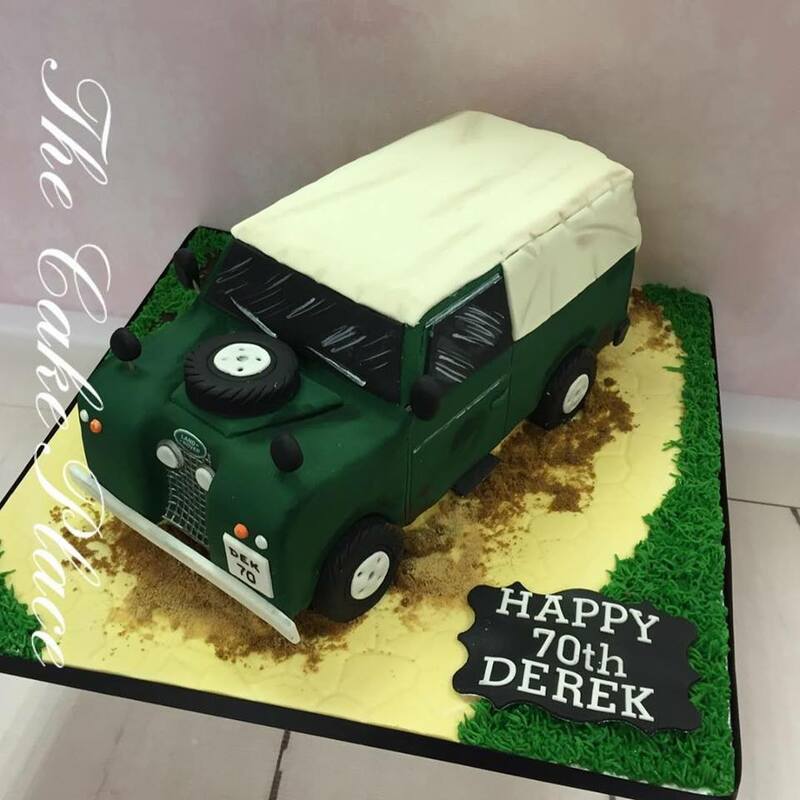 Camper van themed cake , personalized to the colours of the cake shop this lovely lady used to work in. We transformed a 10” square cake into this off road cake. 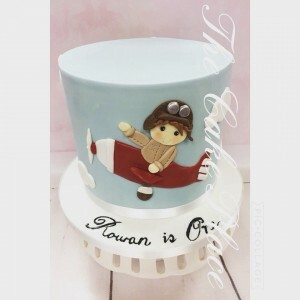 All handmade and modeled , down to the number plate. 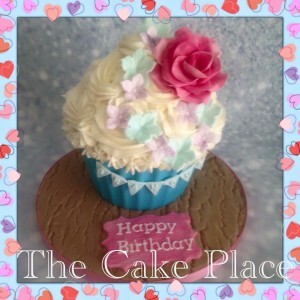 Giant cupcakes start at £65 and serve upto 25 servings, the can be customized to most colour schemes and designs. Bunny cake , with fence detail , handmade carrots & flowers.